Little Massingham is in West Norfolk district. It is located between Great Massingham to the south and Harpley to the north. The modern village is on the edge of the valley and enjoys excellent views across the dismantled railway (NHER 13581) towards Harpley. The village name derives from Old English and means ‘homestead of the family and followers of Maessa’. The Domesday Book records land being held by two men in Little Massingham in 1086. This is the earliest known documentary evidence for the village, but the archaeological records reveal that there was activity here at a much earlier period. The earliest recorded finds are Neolithic worked flints. These include axeheads (NHER 14437, 14817, 21605 and 30238), an arrowhead (NHER 2295) and scrapers (NHER 2298 and 21670). Soil marks of possible flint mines (NHER 18608), where the raw material for these objects may have been extracted, can be seen on aerial photographs. A Bronze Age copper alloy palstave (NHER 2311) and axehead (NHER 2314) have also been recorded. Two possible Bronze Age ring ditches (NHER 13965) have been identified. There is very little evidence for Roman activity. Pottery has been recovered (NHER 13111, 18608 and 25139). A coin of the emperor Claudius made between AD 41 and 54 (NHER 15715) was found by a metal detectorist. The only evidence for the Saxon period is one piece of Late Saxon pottery (NHER 2344) from the churchyard. Parts of St Andrew’s Church (NHER 2344) date to the Norman period, although most of the building is 14th century. A staircase turret and fireplace were added to the tower in the 15th century. Thomas Jekyll restored the church in the mid 19th century. Bits of masonry in a field called Church Furlong may be the site of a second church (NHER 18608). The site of a medieval hall is also recorded. Earthworks of two enclosures south of the church (NHER 25139) are the location of a significant medieval building and probably other settlement. A flint-lined well has also been recorded here. The Old Rectory (NHER 30723) was knocked down in the 1950s. Parchmarks marking where the walls of the old building were can be seen in dry weather on the lawns of Glebelands, a modern house that was built on the site. Two pillars, possibly from a garden folly, and parts of the post medieval kitchen garden wall (NHER 30721) of the Old Rectory can still be seen. Hill Farmhouse (NHER 43989) was built in the early 19th century. The railway and associated buildings were built between 1865 and 1933 (NHER 13581). The station and other buildings have now been converted into houses or dismantled. The sites of a brickyard and kiln (NHER 41785) and a collapsed limekiln (NHER 2346) are marked on old maps. Metal detecting has recovered two interesting medieval finds. 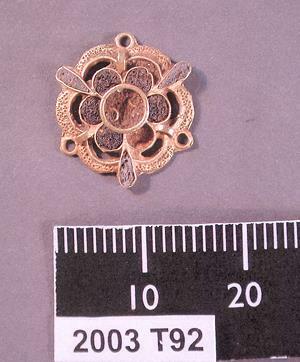 One is a unique 16th century dress gold fastener (NHER 39692). These are depicted on many 16th century English portraits but this is the only example that has been reported to the British Museum. The second is a gilded silver pendant (NHER 36151) depicting a bearded face in relief. Little Massingham House (NHER 22260) and Lodge (NHER 43990) were built between 1904 and 1905 and were designed by the architects Edmund Wimperis and J.R. Best. The house design is based on Bixley Hall (NHER 9876) that was demolished just before Little Massingham House was built. An airfield (NHER 15168) was built in the east of the parish during World War Two. This was a base for Blenheim and Boston bombers, and for a Mosquito squadron. The airmen working at the base used St Andrew’s Church (NHER 2344). Several military graves can still be seen in the graveyard. The lead on the roof of the church contains an interesting selection of 19th century to modern graffiti including some examples probably written during World War Two by firewatchers. There is an intriguing World War Two structure (NHER 23511) that looks like a pillbox except there is no way to get in! The only openings are vents. It is thought that this might have been used for storage or as a substation. Megan Dennis (NLA), 5 April 2006.
http://www.greatmassingham.net/page4.html. Accessed: 5 April 2006.